EVERYTHING YOU KNOW ABOUT BUSINESS IS WRONG: Doing exhaustive research and then a full-on, glitzy launch isn't the best way for a company to launch a new product. Attitudes to risk in business can be paradoxical. What's good for the company may not be so good for the individual, and vice versa. Take this example - it's from the food industry but could be from any consumer-facing sector. In food, there are two basic ways to launch a new brand: softly softly, or full on. Softly softly means you test the market, putting the new product in a few stores and seeing whether consumers take to it or not. 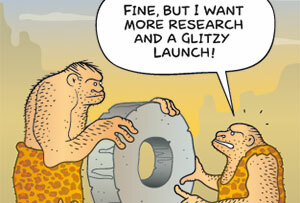 Full on calls for comprehensive initial research followed by a big, glitzy launch everywhere at once. The former is superior in every way. It's faster - you get results from consumers long before you do from research. It's less costly - you don't invest in a national campaign until you know that consumers like the product. And it's more reliable - what people actually do doesn't always equate with what they said they would do. It's not unusual for products to do well in research but fail to sell. So why do so many companies still favour the full-on approach? Because it's less risky - not to the company but to the individual. In most organisations, putting something untested out there that doesn't take off (even if it hasn't cost much to do) counts as a black mark on someone's career scorecard. By contrast, very few people get blamed for an innovation that bombed despite due process. Do enough research and you can explain anything away: your backside is covered. Thus risk aversion at a personal level leads people to increase the risk to the organisation. It's a classic mismatch of incentives - if you ask someone to choose between their own interests and those of the company, don't be surprised when they choose themselves. The same problem can arise with bonus schemes, which reward individuals for actions that depress overall profitability. Such financial anomalies are usually spotted, but when it comes to risk incentives we are predisposed, it seems, to do nothing. So you have a choice - either give people permission to incur small 'failures', or run the risk of the organisation incurring a much larger one.